What’s wrong with the cover of my book, ‘Accounting for Murder’? That old saying is good advice, but I believe most people ignore it. In the same way, we too often judge people by their appearance, accent or other superficial features. They say the cover and the title are the most important elements influencing book sales. 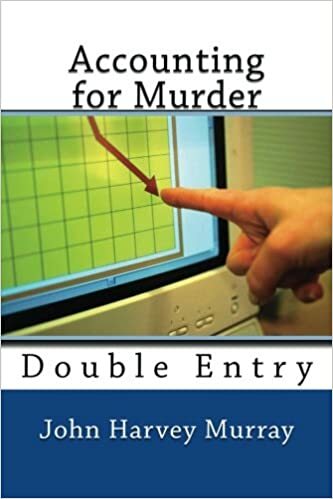 What about the one for Accounting for Murder, Double Entry? Some people think it suggests an accountancy textbook, perhaps How to produce crime statistics for the Police or the Home Office, because it does not tell you it is a novel. If many people think that way, it will be bad news for me, in losing sales, and bad news for them in missing an enjoyable read. I would welcome your views and any suggestions for an improvement. A detective with a magnifying glass. Should he be on the next cover? Author John MurrayPosted on October 18, 2018 Categories UncategorizedLeave a comment on What’s wrong with the cover of my book, ‘Accounting for Murder’? Author John MurrayPosted on October 14, 2018 Categories UncategorizedLeave a comment on How true to life should fiction be? Author John MurrayPosted on October 3, 2018 Categories UncategorizedLeave a comment on Would I have made a good detective in reality?